PVC and CPVC piping are durable, ductile pipe materials that typically do not fail. 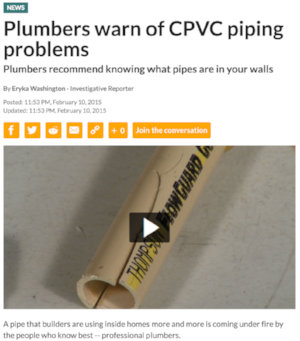 However, PVC and CPVC pipes can become brittle and fail due to improper manufacturing, installation or contamination. It is known that potable water and fire suppression systems in the United States are already failing causing water damage. Once the pipes turn brittle, movement/vibration/seismic activity of the building and pressure events inside the piping system can cause the pipes to break. These events may cause other damage to the property, however the loss due to piping system leaks is due to the brittle pipe, not the non-piping event. Failure to properly categorize the leak portion of the loss can result in failure to subrogate for recovering paid out insurance claims. Piping leaks and damage not directly caused by structural failure of the adjacent structure should be investigated by trained experts to determine the failure mode and responsible parties. Insurance Adjustors should become aware of and learn how to tell the difference between water damage resulting from “Act of God” events and pipes leaking because of defective plastic piping that have turned brittle. Send us your questions, or schedule a time to discuss with us. Older PostDo Cement Drips Cause CPVC Fire Sprinkler Pipes to Fail?